The Schwinn 431 is an upgrade to the very popular Schwinn 430. Critical to a smooth and wobble free ride is the flywheel, and the Schwinn 431 comes with a hefty 25 lbs flywheel, rarely seen in an elliptical trainer in this price range and almost twice the size found on some. Stride length is 18” which is adequate for most people, though very tall users may be more comfortable with a longer stride length. The frame itself has been strengthened compared to its predecessor, though as with recommended maximum user weights, the 300lbs of the Schwinn 431 should be taken with a grain of salt. With dimensions of 59"L x 26"W x 68"H, the trainer is more compact than most, always a benefit if space is at a premium. With a unit weight of 172 lbs, transport wheels come in handy. Footpads are articulated and padded, resulting in minimized stress on feet and lower legs. The console includes a place to stow your Ipod/MP3 player, cooling fan, a towel hook and a water bottle holder. It features a backlit LCD, a real advantage in low light situations. You can choose from 19 different workout programs, incl. manual, 10 profile, calorie goal, time trial, 3 heart rate control, fitness test and 2 custom. The warranty of the Schwinn 431 is adequate considering the price, with 10 years on the frame, 2 years on parts, 6 months on wear parts and 1 year on electronics. 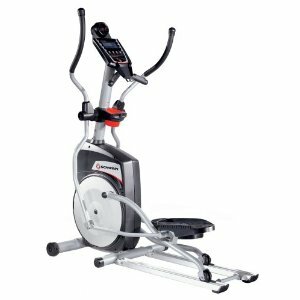 While the under $1000 price qualifies the Schwinn 431 as an economy model, you get a stable elliptical trainer with a smooth ride as well as a lot of nice extras typically found only on elliptical costing more. The Schwinn 431 is definitely a good value and well worth checking out.